The absolute mother of all chainsaws is the Stihl 880 Magnum making other saws look like bread knifes! Boasting a huge 121.6cc and 25" bar this saw has plenty of power to tackle any job you can throw at it. Its design is capable of handling the demanding challenges and extreme conditions, with Stihl recently improving its power-to-weight ratio and muffler design. The easy to clean HD2 filter ensures even the finest dust doesn't get into your chainsaw, meaning more cutting can be achieved in between services! This new high quality air filter prevents even the finest dust away from the engine of your chainsaw consequently the chainsaw has a longer service life. The material that makes up the HD2 filter will not be damaged from being washed clean. The decomp valve needs to be pushed down when starting which minimises the compression pressure when you pull it over making it easier to start. The decamp value is semi-automatic meaning that it has to be manually engaged but it will automatically disengage when your saw kicks over. Using a chainsaw always results is significant vibration causing fatigue for the operator. Thats why Stihl's anti-vibration system is an innovative piece of technology that sets it apart from the rest. The vibration system sees the oscillations from the engine dampened reducing the handle vibration. Is the process of the controller in the carby preventing the fuel-air mixture from getting too rich when the air filter gets blocked up. Ensuring the right amount of fuel is delivered to the carby while taking into consideration the amount of air coming through the air filter. This ensures the mixture is constant and in return results in constant engine power. This feature allows the operator to control the exact amount of chain oil they want for different conditions, allowing the reduction of oil up to 50%. This automatic chain lubrication system ensures that the exact right amount of oil is applied to the chain at the right point at the right time. This precise system means less oil is consumed by the saw and increase the precision of oiling and optimum lubrication. The Ematic system can reduce bar oil consumption up to 50%. Stihl elastostart reduces the shock caused by the compression of the engine when starting it. 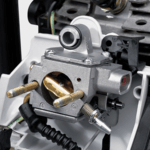 The shock is reduced by the users joints and muscles through the spring or rubber element in the starter handle making it more comfortable to start for the operator.